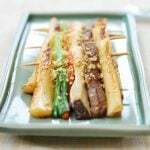 This rice cake, youngyang chaltteok (영양 찰떡), is one of the easiest rice cakes you can make at home! No kneading, no shaping, no pounding, and no special tool other than a steamer is required! 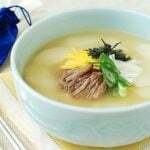 Young-yang means healthy, and chal-tteok refers to sticky, chewy rice cakes that are made with glutinous rice (sweet rice) flour/powder, chapssal garu (찹쌀가루). 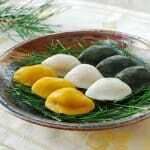 It’s also called by its short name youngyang tteok (or dduk). The tradition of rice cakes goes back to ancient Korea. There are literally hundreds of varieties of rice cakes made with all sorts of grains. 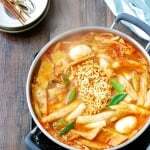 While enjoyed everyday as a snack, light meal, dessert, or in savory dishes such as tteokguk (soup), and tteokbokki (spicy stir-fried), rice cakes are a big part of the special occasion and holiday food traditions. 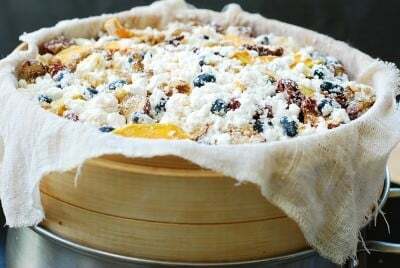 For special days, Korean homes prepare several varieties of rice cakes in addition to the must-have type such as songpyeon for Chuseok (Korean thanksgiving/autumn harvest festival). 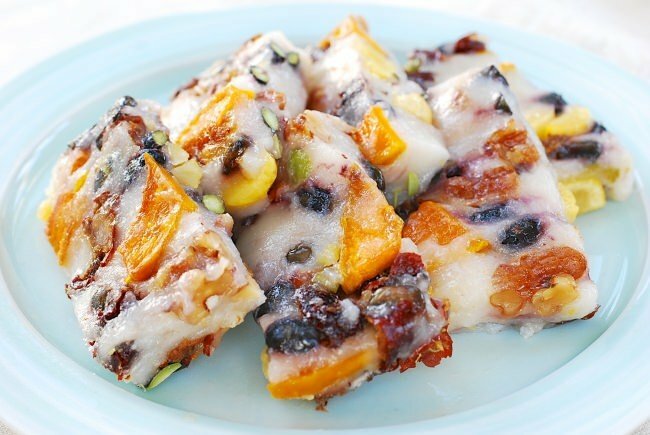 For this chaltteok, black soybeans (called seoritae, 서리태, or gumjeongkong, 검정콩 ), dried jujube (Korean dates, daechu, 대추), and dried pumpkin (hobak ogari, 호박오가리) are traditional ingredients. 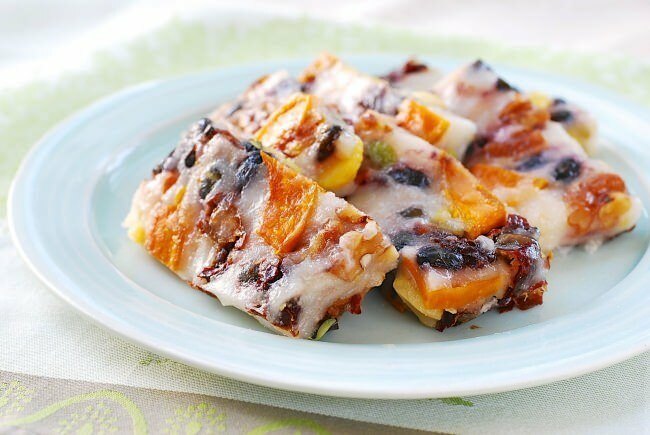 These days, it’s loaded with various nuts and/or other dried fruits such as raisins and dried persimmons (gotgam, 곶감), hence the name youngyang (healthy) tteok. You can throw in any soaked dried beans, or even canned kidney beans (rinsed) instead of black soybeans. For nuts, I used chestnuts and walnuts. Other options are pecans, pistachios, pine nuts, pumpkin seeds, etc. 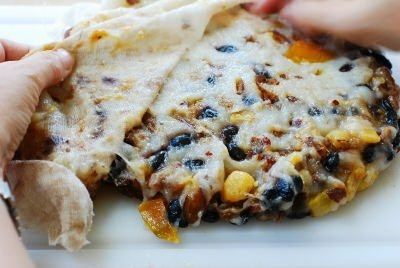 If you’re in Korea, new crop dried persimmons are in season by now, which will be excellent in this recipe. Also, dried pumpkin (hobak ogari) is commercially available in Korea, but not around here! So, I just slice up a kabocha and dry it in my dehydrator for a couple of hours. You can air dry them for a day or two if you don’t have a dehydrator. Dried pumpkin tastes sweeter and holds up its texture better when cooked. I use frozen wet sweet rice powder (chapssal garu) that is available in the freezer section of Korean markets. If unavailable, you can make wet powder at home by soaking sweet rice and finely grinding in a blender. Though not traditional, my secret ingredient is almond meal! One day, I added some almond meal, leftover from my daughter’s macaron baking, to use it up and really liked the results. It adds a nutty flavor to the rice cake while slightly loosening up the dense texture, but it’s absolutely optional! This recipe is very flexible! You can vary the amounts of the rice powder or other ingredients. 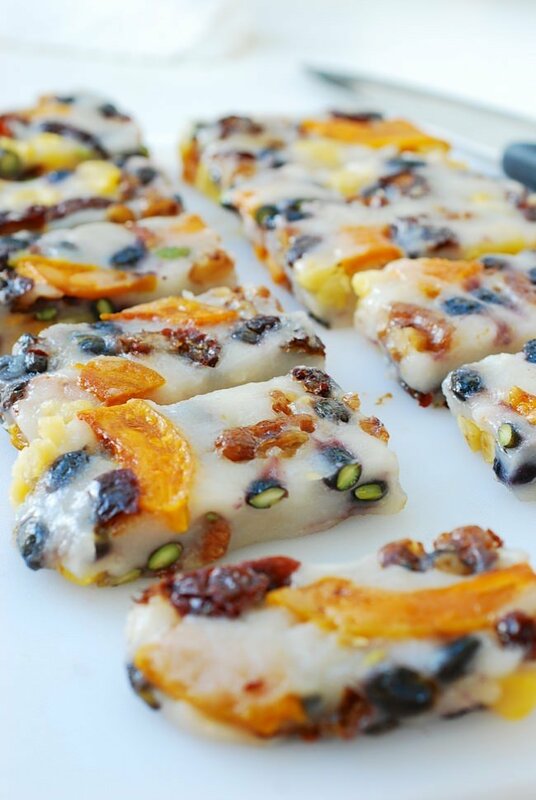 Any combination of sweet rice powder, some beans, nuts, and dried fruits will give you tasty, healthy rice cakes! 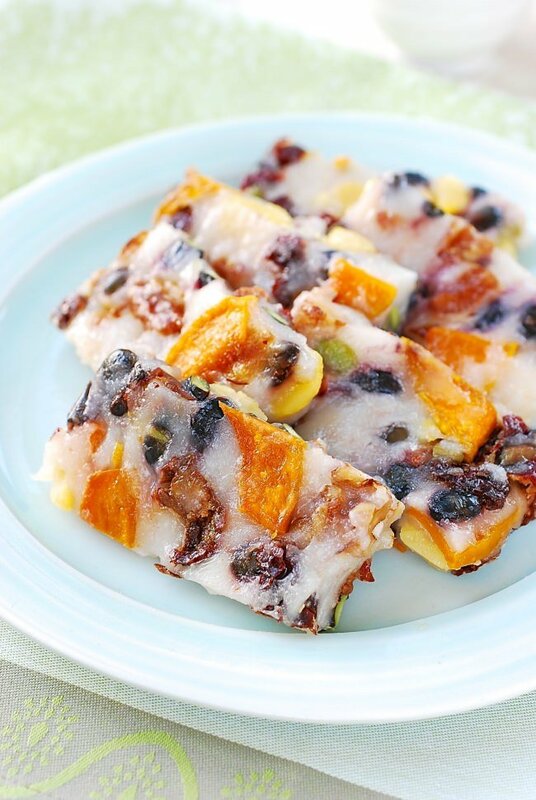 Korean rice cake made with sweet rice flour and healthy ingredients such as beans, nuts and dried fruits and pumpkin! 1/2 cup dried kabocha or other type of pumpkin - optional - See note. 5 cups frozen wet sweet rice flour defrosted at room temperature - See note. Prepare the beans by soaking in warm water for a few hours. Rinse the jujubes and cut each one around the seed into 3 to 4 pieces. 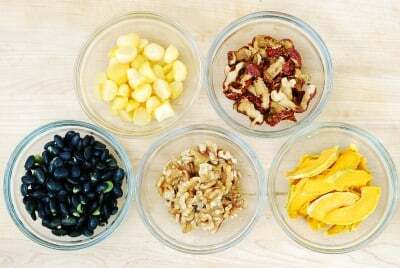 Rinse the optional dried kabocha and rehydrate by adding a tablespoon or two of water at a time, until softened. Prepare the nuts. 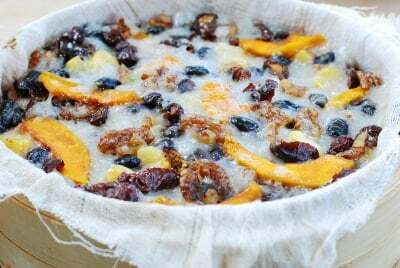 In a large bowl, combine the rice flour, sugar, and the optional almond meal. Mix well by hand or a whisk until everything is well incorporated. 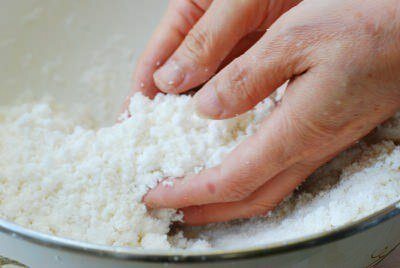 Add 2 tablespoons of water and rub the powder between your palms, breaking the big clumps, to evenly distribute the moisture. You don’t need to try to break up small clumps. Add all the other ingredients and gently toss to combine everything. Steam for 30 minutes, and then remove the steamer insert from the heat. When it’s cool enough to handle, flip it over onto a cutting board. Remove the cloth. Shape the rice cake to a rectangle if desired. Wet your hands before touching the rice cake. Cut into serving size pieces. Keep it in an airtight container if serving within a day or two. To store for a longer period, individually wrap and freeze the rice cake. For best results, do this within a few hours of making. Simply leave it out at room temperature until it softens before serving, or you can briefly defrost it in the microwave. 1. To dry kabocha pumpkin, cut a medium size kabocha into quarters. Peel each quarter with a potato peeler, and then cut into 1/4-inch thick slices. Dry in a dehydrator for 2 to 3 hours or in a lowest setting of the oven. One quarter is sufficient for this recipe. Keep the remaining in a bag at room temperature or in the fridge. 2. To make sweet rice flour at home, soak 2-1/2 cups sweet rice for 8 to 10 hours or overnight, completely drain, add 1/2 teaspoon of salt and use a blender to grind as fine as possible. Thank you so much for posting these lovely recipes. I am Korean American living in Los Angeles. 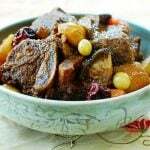 Your Korean recipes are easy to follow and my finished dishes are always successful. Your website always brings my heart closer to my birth country, Korea. Thank you. You’re so welcome, Jane! It’s my great pleasure to share. So happy to hear my recipes helpful. Thank you so much for leaving me comments to let me know. Your words mean a lot to me! mmmm, this looks so delicious! I want to try this sometime! Yes, it’s really good! Staple at my house. Hope you get to make it soon. After had successfully tried different of your recipies, I’m definitely gonna try this~ alooks amazing~ Thank you~! Yes, and since you’re in Korea, you will have no problem finding all the ingredients. I make this quite often, and everyone of my family and friends loves it! Sure~ You’re right! I live here and I’m gonna take advantage of that fact~? 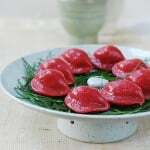 I remember eating Korean rice cake called “Si-Roo-Tteok.” I would love to have the recipe for it. Thank you so much! Thank you for this lovely recipe. Can I use regular glutinous rice flour? And will I need to add water if I use that? 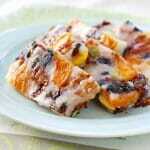 Can you share more sweet rice cake recipes? I just love them! It’s not traditional and will a little different but you can. Yes you will need to add water to sufficiently wet the flour. I wish I know how much water to add, but I will need to try it to know. I love rice cakes and making them. I will definitely share more. Cheers! I would like to try this recipe. Thank you for sharing. This is a favorite of mine. Healthy comfort food! Thanks for stopping by Christine!